Ski at your own risk!! These lines are dangerous. CLICK PICTURE TO ENLARGE. All video clips and images are the property of SteepChutes.com, Copyright 2009. Recognition must be given to the source when playing these clips. click on Icon and right mouse click and select SAVE TARGET AS to download the movie to your desktop. Special thanks to Lee from Handcrafted Media, and Scott (sherpa) for boarding and skiing some incredibly steep and hairy stuff so that others have the opportunity to enjoy the nice views in these notches and chutes. 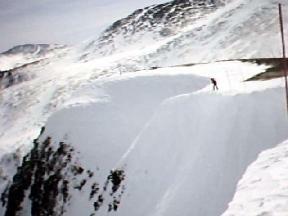 This view is of two commonly skiied Lake Chutes Double Black runs at Imperial Bowl, Breckenridge. I would like to thank the Breckenridge Ski Patrol for taking me into their map room and helping me understand the various chute names and provide opinions about the Lake Chute terrain. I will be up-dating this page soon with their perspectives and information, and provide added pictures and opinions from other skiiers and boarders. One note I'd like to add about skiing the Lake Chutes. I'm glad the Breckenridge Ski Patrol has daily avy control at the Lake Chutes and easy access for the following reasons: First, often there are fairly high winds (most are westerly to easterly), cutting across the top of the Lake Chute cornices. These cornices can build quickly and heavy spin drift is both a blessing and a curse, mostly a blessing as it affords nice powder in the chutes. The spin drift, on a very windy day, can create immediate 'white out' condition in the various notches. For example, I dropped Elevator with some blue sky above and with sudden gale winds resulting in zero visibility for the landing. I cannot tell you how interesting it is to land completely blind from a 25ft drop knowing there are rock bands on both sides and not knowing where I landed, and knowing there is some 300ft of steep terrain below. Beware, take it easy entering these chutes to test conditions during descents. On a perfect day, none of these conditions apply and things are much easier and nicer. The North Pole chutes at the Basin have similar weather-based hazards the worst of which I experienced during spring when it was warm a day before and the surface froze over completely over night. I once descended the 1st Notch in deadly surface ice conditions, and have thence decided to never drop those chutes when the surface turns to ice. I'm not referring to consolidated crusty snow which is quite okay, I refer to pure ice covered snow which affords a lethal hard icy surface. I only experienced this on one occasion. Here's my shameless initial scoring of this Lake Chute line, which will be adjusted by consensus, accordingly. Using the wonderful Wildsnow D list for grading, I'd rate the steep Cornice Chute, (Elevator) an 'in bounds' Double Black EX, D10-11 plus an R2, when the cornice is very overhung, and less severe when it has been blown by patrol. The drop in over the 30ft cornice can be very steep possibly up to 70 degrees before hitting the bowl area of around 40 degrees. This descent, fortunately, is often filled with spin drift that allows for more control. With that said, the descent is so steep that cutting in too low or east on this cornice will direct a skiier straight into the rocks below, a decidedly unwelcome prospect. If the cornice is bisected up high, the drop-in is EXhilerating, but reasonably safe. The first 30ft are the hairiest, after that the slope backs off to a normal double black expert exit into a wide snow covered basin. 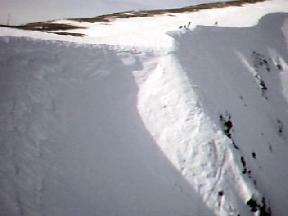 Consequences for failure, once half way down, are considerably lower, more in line with a steep double black run. Okay this little bugger has a few teeth. 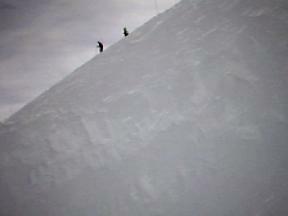 The chute starts off a cornice fairly tight and at 50-55 degrees. The chute navigates back and forth between rock bands at 50-55 degrees for most of the path, and continues meandering between rocks at the 45 to 50 degree range of slope. In this regard, I'd rate this a Double Black D10 or D11 with an R2 rating, as well. 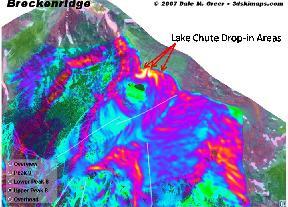 This chute does have consequences, as exposed rock bands lower in the chute need to be negotiated or jumped. Also some care is needed to avoid hitting exposed rock or rock and ice. Down lower in the chute, If the rock band is jumped consider 20-25ft of air before landing in the curving snowfilled basin below heading in direction of the frozen lake. Also, hidden rock below snow can make picking a landing somewhat precarious. 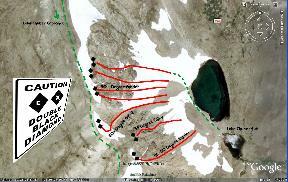 However, compared to the First or Second Notches at the North Pole, this run is relatively short and sweet. 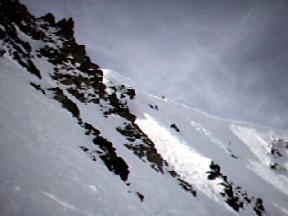 The chute starts off a steep ledge to a vertically descending cornice at 50-55 degrees. You can either split slightly left and drop over an exhilerating very steep headwall descending into a tight chute, or continue straight down until above the rock ledge and bust right to join up with the less daunting Elevator bowl. Either way, the chute navigates back and forth between rock bands and vertically descending cornices at 40-50 degrees for most of the path. In this regard, I'd rate this a Double Black D10 or D11 with an R2+ rating. This chute can have consequences, as exposed rock bands are on both sides if you drop straight in and slightly left. A fall from the top could be serious, so take care. Also note: I dropped this leftward headwall a few weeks after I'd done it easily in nice deep snow only to later find exposed rock in the headwall and had the unpleasant need to go airborne high above the steep chute and between cliff sections. Fortunately you can carve sharp turns between the vertically descending cornices at higher speeds. 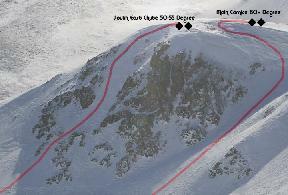 The Breckenridge Ski Patrol have named most of the steep chutes. Facing the Lake Chutes from the lake, furthest left or east is WACKY TIM'S, next the obvious direct line down the large cornice bowl straight down descent is ELEVATOR and a meander of this large cornice is called ZUTE CHUTE. the considerably steep rockband prow immediately right of the Elevator Bowl Cornice is called VERTICAL CORNICE. The next steepest chute to the right of Vertical Cornice is CRAZY IVAN I, the next over is CRAZY IVAN II, the next over from Crazy Ivan II is ZERO CHUTE, followed by 9 LIVES for dodging rocks during descent, and then the remaining area terrain all the way back up to Imperial Peak is called EASY STREET. Also, there is reportedly a rapell ski line that runs downward between Wacky Tims and Elevator, and this chute is called the SPINE LINE. Please note folks, like the reason that this website was created, not all double blacks are the same. I put this site up for two reasons, one to give delicious beta to EX riders who find 55 degrees the only way to go, and next, to give warning to double black skiiers who like a few steep bumps, that maybe they want to consider the seriousness of these descents first. When the sign says EX, they mean it. At A-basin, people know when descending the notches of the Upper East Wall they're in real chutes and a not an easy ascent to the peak will let the normal double black skiiers to maybe re-consider doing Pali or something similarly tame. Whereas, at Breckenridge, the average double black skiier or boarder can make the 300 yard hike in reasonably short order and slide gingerly down the cornice summit while marveling at the beautiful mountains and to then be goaded into droping-in. My recommendation is that if you think you're up to the task, but have little experience in double black EX terrain, to take a few rides down Easy Street first. If that's no big deal, then meander over to the Lake Chutes. You could survive a fall down a few of these, but you won't like the sleigh ride with the Ski Patrol either. At the North Pole, if you wipe from the top of the 2nd Notch, you probably will wonder why they're putting someone like you in a body bag at the base. Take care and go slow until you know what you're up to doing. With that said, SHREAD IT!! Thanks Guys for repairing my stuff!